What does 500,000 pounds of food look like? 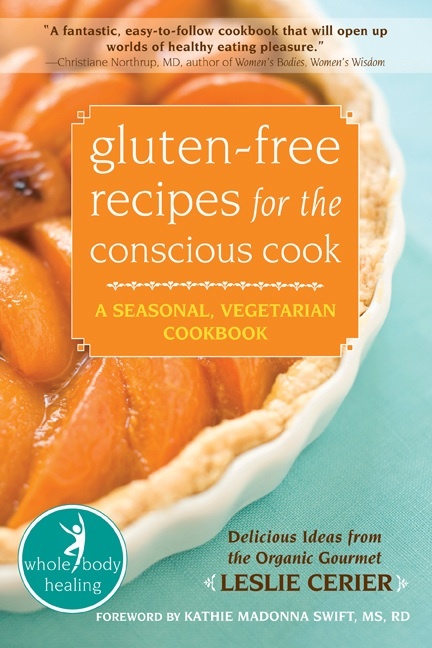 Up next in my “May is Celiac Awareness Month” bookapalooza giveaway is organic chef, Leslie Cerier’s cookbook, Gluten-Free Recipes for the Conscious Cook. Another vegetarian favorite of mine, this book is filled with delicious, nutrient-dense recipes that are not only easy to make, they come with added health benefits as well. Leslie specializes in gluten-free, organic, whole foods cooking and creates her recipes with healing and thriving in mind. Not only does this cookbook have traditional recipe sections (breakfasts, main courses, sides, desserts), Leslie also treats us with savory sauces, sushi party ideas, basic grain cookery, and instructions on how to make nut/seed butters and milks. She covers it all—and does it with style! Check here for more on Leslie, her cooking classes, recipes, and other cookbooks. • Leave a comment on this post listing your favorite gluten-free grain and what you like to do with it. Example—Teff pancakes with goji berries and maca. By the way, this recipe is in the cookbook. • Make sure to include your email address when prompted (it will only be visible to me) so I can notify you if you win. • The contest closes Friday, May 18th at 6 PM. It doesn’t matter if you also entered Monday’s giveaway. Who knows, you might win twice! Go for it. Peace, love, and gourmet food! This entry was posted on Wednesday, May 16th, 2012 at 11:25 am	and is filed under Celiac & Gluten Intolerance, Gluten-Free Recipes. You can follow any responses to this entry through the RSS 2.0 feed. You can leave a response, or trackback from your own site. Melissa, when I found out that this cookbook author sometimes works at Kripalu, I thought you guys might have met at some point. Please don’t enter me in the giveaway, but I love reading your review. Yes, Shirley. Leslie does workshops at several different places, Kripalu included. Rice: I use various kinds and integrate it with many foods – pancakes, stir-fry, muffins. Just love it with coconut milk and strong spices. Gluten free oat flour – I add it to my smoothies every morning for carbs and it gives a nice thickness. Looks like a gem! Hard to pick a favorite, but I love a good quinoa blueberry porridge with chia and coconut milk. quiona – mix cooked quiona with cooked gluten free oatmeal- add hemp milk & nuts or fruit and you have a breakfast fit for a queen ! I like using GF oats to make oatmeal for breakfast. The night before I put 3 or 4 tablespoons oats in a bowl, add about 1 cup rice or soy milk, cover and put in refrigerator. In the morning I add some cinnamon, chopped walnuts and diced apples – yum! Sometimes I add 1 tablespoon chia seeds. It’s Gluten-Free Prairie Oats and Toasted Oat Flour for me! The high fiber and protein make it an easy choice at the beginning of a long day. I’ve heard it has a lower glycemic index too. Also this Oat flour acts a lot like wheat making it very easy to change out in most recipes. But my “go to” is the Oat based granola with quinoa, flax and coconut. I make a huge batch at least once a week. It is a staple in my diet. Hey, maybe I should write a book? Help! I don’t know any recipes or ingredients… that’s how I found your website. My doctor just told me I need to go gluten free and I’m so confused about how to do it!! I’m trying to educate myself and I figure I just need to find some recipes first to prove to myself it can be done. Right now, I’m feeling very lost and it seems like EVERYTHING has gluten in it! Right now my favorite gluten-free grain is forbidden rice! I like to have it with some veggie curry, yummy! Of course, my favorite grain changes a lot. Hmmm…I have Leslie’s first book and just haven’t gotten around to looking for this one yet. My favorite grain is millet. My favorite grain is not technically a grain- it’s quinoa. i love it because it’s so versatile. I must have 10 different recipes that I like to rotate and I am always looking for more! Favorite gluten free grains: garbanzo flour and quinoa (with Tef up there as well). My favorite GF grain is Buckwheat. It has such a rich flavor. Best things to make with Buckwheat are pancakes or muffins. I use it for a GF Mexican Chocolate cake as well. It gives it a deeper, richer taste. Anything with quinoa. Love making fried rice subbing with quinoa. Rice products seem to be the going favorite around here. I found some gluten free baking flour recently; made a delicious lemon meringue! I think my favorite grain is rice, followed by quinoa. I would like to make sweet rice, like we had for dinner last night at a Thai restaurant, with mango and custard. I think they must use something like sweetened condensed milk. I think you actually use a kind of rice called “sticky rice”. I really enjoy playing with different kinds of rices. Thanks for asking. Quinoa in chicken broth with veggies! Rice with vegetables mixed in and herbs – love brown rice for fiber! We’re enjoying a lot of almond flour and coconut flour containing recipes these days. Thanks for the opportunity! I love flax seed waffles with fresh strawberries and cream. Would love to win the cookbook! Hmm, my favorite gf grain is actually one I haven’t had in ages – millet. I love it simply prepared with just some coconut oil and seasonings (depending on mood). But, I should give kudos to plain old rice – I love all variations – brown, red, wild, etc. Honestly, I’d much rather nosh on them whole than use the gf flours, but sometimes the flours have their place! I love to use coconut flour in my baking. I know it is not a grain, but I use it to make coconut corn muffins and a mean chocolate cake! It is gluten free, you only use a small amount in your recipes and is high fiber! rice–because i love rice + beans. but buckwheat is a close second! Rice–So many varieties and so versatile. It’s a staple in my diet. I eat rice cakes, brown rice pasta, steamed rice, fried rice, rice and beans, risotto, etc. Definitely rice! I’m weaning hubby off potatoes slowly, and rice is a good substitute. I love it as rice pudding, but all I do is add milk, sugar and just a sprinkle of cinnamon to already cooked rice, nothing fancy. I’ve had quinoa as a cold curry salad, but I’ve yet to be brave enough to cook it myself… silly, huh? Almond flour–no it’s not a grain, but I try to be as grain-free as possible. I like to make vegan rosemary crackers with it, sometimes with a little chocolate on top. My favorite gluten-free grain is rice: I love risotto! Gluten-free oatmeal for my morning breakfast! Also like quinoa porridge with dried fruit mixed in! Quinoa with avocado and roasted garlic! I like buckwheat crispies for breakfast with fresh fruit and almond milk. Soak buckwheat groats 6-8 hours, changing the water when you think of it. Then dry at 104 degrees for 3-5 hours until completely dry. The crispies are a good base for a granola of seeds and nuts also. I am sensitive to oats, even gluten free oats so I use buckwheat crispies in my granola. I love to make shortcakes out of coconut flour. The flavor goes really well with fresh strawberries. I recently discovered I love buckwheat! I’ve been on a crepe making kick for the past 3 weekends! Love it!! It would have to be short grain brown rice cooked with juice sweetened cranberries and toasted walnuts. Yum. My favorite is quinoa. It’s great in vegetable salads or 1 dish meals like moroccan chicken! Definitely short grain rice, served with a delicious stir-fry. I love the multigrain oatmeal for breakfast. I add cinnamon, raisins or other pieces of dried fruit, the heat softens the dried fruit and tastes decadent! blueberry corn muffins with buckwheat flour!! Disclaimer: All material on this website is provided for informational and educational use only and should not be used for diagnostic purposes. Consult with your physician regarding any health or medical concerns you may have.